I am no rock critic. Even if I was one, there is no way that I could be objective about this particular gig, or about this particular band. Since discovering Ride’s music in 1992, my mental image of them had developed almost exclusively through their studio recordings (and the rare press clipping/magazine/radio interview); I never got to experience them live because of the combination of my youth and of bad timing. Having never seen them in the flesh, I couldn’t properly envision the fact that this music that meant so much to me was created by real people. 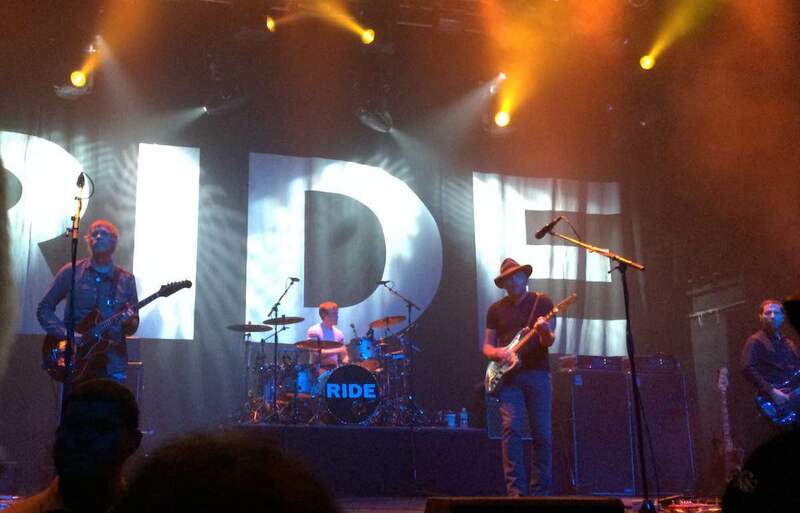 By 2014, Ride had become a bittersweet memory in my head; a missed opportunity; a symbol of a world that existed beyond my limits as a teenager. It’s silly in a way, but the music and its creators had morphed in my head in those two decades from fact to myth, and in that time, I sort of forgot that those creators were humans that still walked this earth. I don’t think I need to explain the whirlwind of emotions that hit me when the banner was unfurled in Barcelona. Everyone reading this probably felt them right along with me. While I have crossed state lines before to see other bands, nothing quite compared to this. I knew that the Terminal 5 show had sold out, and that it would be filled with other die-hard fans. I typically go to concerts alone, both by circumstance and by choice; unless I know other people who are as passionate about the band as I am, I prefer to be alone as the music takes over my senses. However, for this concert, I did bring my husband, both because he had never been to New York before, and because he needed to be properly introduced to the music that had become part of the fiber of my being. The opening act (Ash) finished their set and I felt my senses heightening as I anticipated what was to come. Just before Ride came on stage, I felt a wave of something – not quite sadness, but the sense of saying goodbye to the life you currently know, because you know that what is coming next will change everything. And boy was I right. The anticipation and the breathless wonder that I felt in that moment just before the band broke out into Leave Them All Behind was matched only by the sheer power and beauty that rocked my body and soul with the first chords. I was very close to Andy’s guitar at stage right, and I could feel my entire body shaking with the waves of sound coming off that stage. The decibels permeated every cell in my body and it was like the music had taken over my bloodstream and my nervous system. In fact, the first four songs in the set (LTAB, Like a Daydream, Polar Bear, Seagull) were a perfect, powerful opening quartet. I never had a chance to catch my breath; Loz and Steve’s merciless two-pronged attack stole it from me. I didn’t mind. Being so close to the stage was an overwhelming experience. I usually opt to listen to concerts further back in a hall, for acoustical reasons. However, this was one concert I needed to see to believe, and it was almost too much to process at times, to know that I was about 25 feet from this glorious racket. I kept catching myself closing my eyes to immerse myself in the roar but then I would force them back open to see the incredible reality in front of me. For once, I didn’t want to live in my head. The world I wanted to live in was right where I was, right in front of my eyes. At the time I am writing this review, seven months have passed since this show, so small details about the night have been lost in the ether of time, but what hasn’t been lost is how the music made me feel. The overriding feelings for me that night were wonder and gratitude. The setlist was an absolute dream. I would pick out highlights but really, everything played was something special. When Ride closed their set with Drive Blind, I thought that my mind could not be blown any more than it was at that moment. I should have known that these four souls would know how to take us even higher. The encore started off quietly, with a hushed, reverential sounding ambient passage in B Major. I was racking my brain to figure out what this was; it didn’t sound like anything from their catalog that I could recognize. Something new, perhaps? Another part of me was yelling at myself to stop thinking and to just enjoy how gorgeous this was, so I did that. Then, the guitar riff started… and the unmistakeable drumbeat kicked in. I stopped breathing. If there was ONE Beatles song I would have chosen to hear Ride cover, Tomorrow Never Knows would be it. When Mark’s vocals began, I felt my hands rise up involuntarily as I blinked back tears for this amazing gift. I still can’t believe that I was there to witness this in person. By the last song (Chelsea Girl), I was on one of the most intense emotional highs I had ever experienced in my life. The concert had surpassed all of my expectations and I was completely stunned by what I had just witnessed. 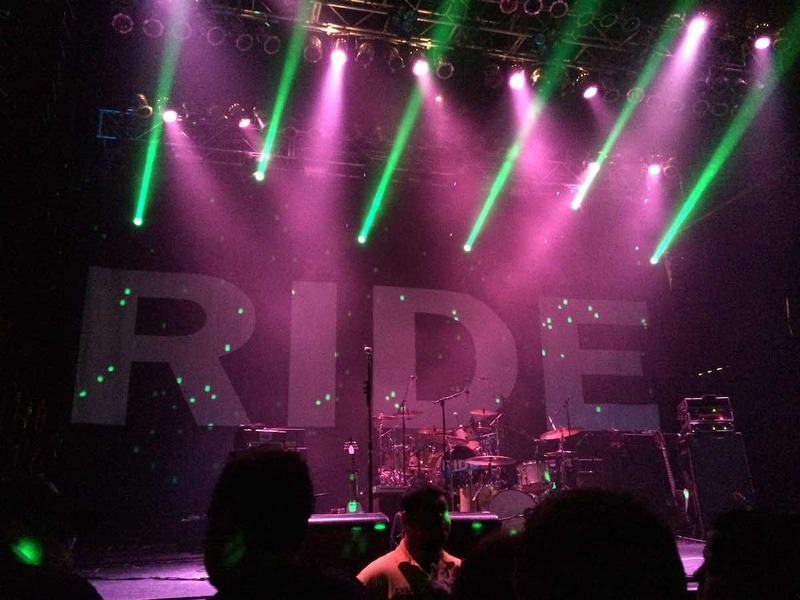 Ride had yanked my soul from my body for the duration of their set and as I returned to earth, I suddenly realized that I was worn out from being put through the emotional wringer, my voice was starting to become hoarse, my feet were aching… and I wouldn’t have changed a thing. On the walk back to where we were staying that night in Hell’s Kitchen, I asked my husband what he thought. He said he enjoyed it, particularly the fourth song. Unbeknownst to him, Seagull is my favorite Ride track of all time! He may never be the fanatic that I am, but at least I know he’s got good taste. The two other Ride shows I saw later in 2015 were both quite memorable (particularly Birmingham, Alabama, where I got to meet the band and some very special fellow concertgoers who have become my friends), and I have no doubt that if I’m lucky enough to see another Ride concert in my lifetime, it will be unforgettable. But no matter what’s in store in the future, this concert at Terminal 5 will forever stand out in my head as the moment where I got to rewrite the ending to a story I had thought was finished; where I got to experience the ecstasy of having a dream fulfilled; where I found out that sometimes, reality is even better than anything the imagination can come up with! What a privilege it was to be a Ride fan in 2015.